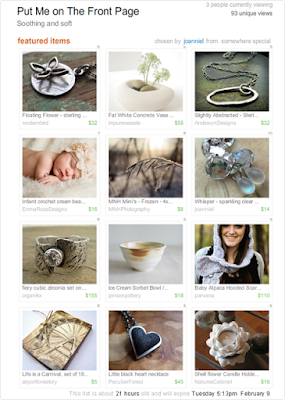 I got a message yesterday from the curator of this Treasury that I was included in it. It's a wonderful Treasury, I love the colors and it's introduced me to some other great artists on Etsy.....and check out the title. I'll be honest, I didn't think we'd end up on the front page, not because it's not a great Treasury. It is, and I love everything about it. But, well, I just didn't think it would happen. How often do you ASK to be put on the front page (or featured) and actually end up there???? But she asked, and she received. All I can say is, thanks for taking me along for the ride! Congratulations and you certainly were in a beautiful treasury! Have a great Monday! I think I'll get back into doing more Etsy treasuries again, it's a rush to snag one and show the world all of my favorites! See you in the wind Sweets! I knew you would understand Michaela~ It was a great day when I found your blog.